Without giving certain details away, there’s a scene in Jackson Galaxy’s biographical book, Cat Daddy, where a cat is misdiagnosed at the vet’s office as having a condition so hopeless the vet urges him to euthanize right there. Breathlessly (for us as the reader), Jackson’s friend Dr. Jean Hofve (a retired veterinarian) shows up in the nick of time and senses what’s really going on almost instantly. Why? Because she knows cats. Tip: I found more results using the “Find a Feline Practitioner” search than the “Find a Cat-Friendly Practice” search. 2. When scoping out a vet, check their website – especially the Bio or About section to see if they mention having cats at home. Look for cat-oriented images and words on the site. If necessary, consider having the audacity to call the office and ask which vet on staff has cats at home. 3. To make sure the vet has a good reputation with cats, look for lots of reviews by happy cat guardians. Look the vet’s name up on a user review site (my favorite is Yelp.com). 4. 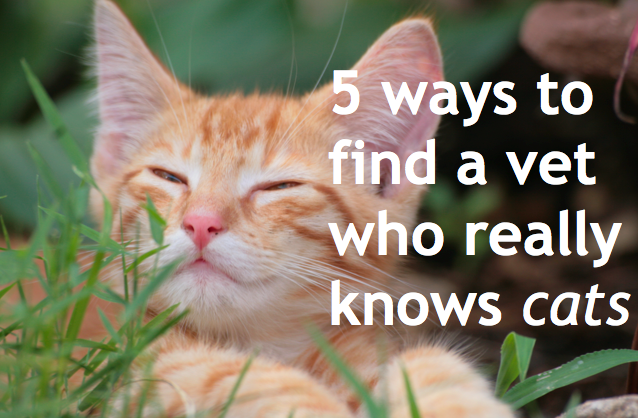 Ask every local cat person you know if they have a vet who is great with cats. Facebook and email may come in handy here. Let’s hear it for the vets with the joie de feline! Best natural cat foods list newcomers! I have had great experiences with Timpanogos animal hospital in lindon utah. Kinda pricey, but amazing and thorough care for all animals. their office has a separate entrance for cats, and they also offer boarding services for cats. took good care of my family cat. I think its best idea. How we can save cat life ? And i appreciate Liz-cat’s activity. Dr. Richard Palmquist At Centinela Anmal Hospital, Inglewood, CA. is the best of both worlds -western medicine and holistic treatments. And Dr. Mark Hohne at East Valley Vet Clinic, Sun Valley, CA is an amazing diagnostician. He’s great with both dogs and cats, has both at home. Really loves animals, and goes the extra mile. I cannot recommend strongly enough the vets my cats see. Dr. Cindy Olsen at Portage Park Animal Hospital in Chicago sees one of my cats for acupuncture and she is amazing. 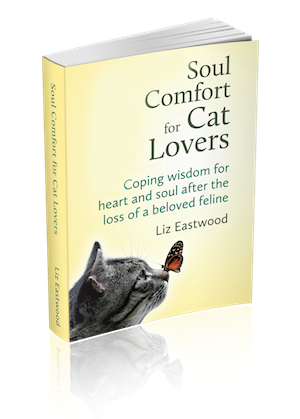 She is great both for holistic and conventional care and she knows cats extremely well. My cats also go to College Station Cat Clinic in Wheaton, IL for their conventional care and both Dr. Watson and Dr. Winterowd are phenomenal. They are in a new building they built just two years ago and can do a lot of things in house that other clinics would likely refer out to a specialist. They see only cats and are very passionate about feline veterinary medicine. Dr. Karen’s Critter Care, 827 W. Wyoming St.; Allentown Pa. 18103; 610-434-PETS (7387). I had been searching for a vet to help my 10 yr old DSH tabby spay (female) who goes through these mysterious fits where she stops eating and wont allow herself to be touched. While we still don’t know what this was, Dr. Hess has turned out to be a wonderful vet who understands cats. She helped my 16 year old male until it was his time to cross the bridge. Dr. Karen Hess has impressed me as a person who understands cats. Dr. Sterling Iwashita, of Koolau Animal Hospital in Kaneohe, Hawaii, was phenomenal with precious felines. He has had several over the years, and speaks proudly of his own babies when opportunity arises. His calming presence made even our most dramatic baby sedate. The Cat Practice, Birmingham, MI. I refuse to take my cats anywhere else. I’ve even paid out of my own pocket for some of my fosters to be seen because I didn’t trust anyone else. Can’t believe I can’t find a good holistic vet around Long Beach, CA. But I had wonderful cat vets in Alexandria/Springfield, VA. Dr. Andrea Tasi if you want homeopathic vet. She treats only cats and is wonderful with them. She does home visits and phone consults. The Kingstowne Cat Clinic is also a great conventional vet practice. All the doctors there are wonderful. They even worked with Dr. Tasi when needed. Thank you for all these helpful recommendations! For Philadelphia – I go to the Cat Vet of South Street – Dr McKinstry – I love her. The Cat Doctor is also wonderful. I would like to recommend all the vets at Cedar Bluff Animal Clinic~ Drs. Clark, Cheadle, Rainey, Straka, & Whitmere~ all are awesome, cat loving & knowledgeable veterinarians. My absolutely favorite veterinarian at this Knoxville, TN, clinic is Dr. Kerry Seyfert Gee who is taking time off to birth & mother her daughter. When I lived for many years in New Orleans, Dr. Violet Nix at Chateau Veterinary Hospital was an exceptional cat veterinarian who treated & loved three of my cats who grew old & went to the Rainbow Bridge. I will always love the way Dr Seyfert and Dr Nix loved & cared for all my cat family. We use Alamo Feline Health Center in San Antonio, Tx. Dr. Gary Norsworthy is a board certified feline specialist. They are a cat only vet service. My kitties appreciate not having to be around dogs in the waiting room; it is less stressful for them. We have been using them for years and appreciate the care all of the employees show to the kitties. We adore Chambers Creek Veterinary Hospital in Lakewood, WA. Highly recommend two vets there in particular – Dr. Tobiassen and Dr. Thiessen. They both “get” cats, and provide thoughtful, caring attention, working with us, trusting our observations, and as important, our kitties respond really well to them. We LOVE, love, love the Sacramento Cat Hospital in Carmichael, CA! (Suburb of Sacramento, CA) It’s about 15 minutes from my house and we drive past many other vet hospitals on the way there, but it’s so worth the drive! They have three doctors there who are wonderful, and all of the techs & assistants are fantastic as well. They also work with a team of outside specialists and a holistic care doctor. I was a very inexperienced cat owner when I first started taking my cats there, and they’ve taught us SO much about cat care. I am now working very closely with them to manage my 13 year old cat’s pancreatitis & inflammatory bowel disease, and I really trust the care I get from them. I am a very “nervous mawmee” and I’m constantly on the phone with them, it feels like, asking about this or that, and they never get frustrated with me. 🙂 They really understand my cats and I know they see dozens of cats a day, but it always feels like they’re excited to see mine. I was also very impressed by Dr. Keuen Kim at the VCA Sacramento Referral Center, on Old Winery. We took our oldest cat there to see a dental specialist there and learn more because we had never dealt with dental disease in a cat before. He was fantastic with our boy and very thorough! We ended up choosing to have his operation done at the Sacramento Cat Hospital (where they did a great job with our little boy! His mouth is doing great now) but would have felt just as comfortable getting it done at that VCA with him, especially if it were a more complicated case. His website seems to indicate that he was hired on as an emergency medicine specialist (that VCA is open 24 hours), but we saw him as a dental specialist. It’s definitely not a cats-only place and the waiting room does mix cats and dogs, but once we got back to the exam room to see the specialist, he was great. We had some blood work done there and they were very prompt at having the results delivered and interpreted to us by the doctor himself and then forwarded to our primary care doctors (the Sacramento Cat Hospital). Dr. Sarah B. Tomalty at Little River Veterinary Hospital in Northport, Maine. She is, bar none, the best vet I’ve ever had — and she obviously knows cats and loves them, too. She always took the time to listen to me when I had concerns or questions about subjects ranging from vaccination schedules to raw feeding. I hope I have another vet as awesome as Sarah someday. He great and cautious about over vaccinating. Well, I don’t have a kitty anymore but I do appreciate your article and when I do have another kitty I shall use the guidelines to find a vet. I was less than impressed with the one who looked after MoMo. Just north of San Diego, CA is a neurologist/neurosurgeon named Dr. Tammy Stevenson. She is brilliant, kind, patient and an absolute kitty lover!! Dr. Kaneko at the Cat Clinic of Davis. His info. is 1341A W. Covell Blvd. (in the Marketplace shopping center) Davis CA 95616 (530)756-PURR(7877). We were SO happy with him that when we moved out-of-state we wished we could take him with us. Unfortunately we’re still trying to find a feline-centric vet in the southwest MI area. Wonderful idea of compiling cat-focused vets, thank you. So true. I’d ask whether the vet has a cat at home. We love our mobile vet Dr. Richard Goldstein and Dr. Letrisa Miller, a feline specialist in Connecticut. Both write for Cat Wisdom 101 and of course have cats at home. Great advice, Liz! I’m going to add to this: when you find a vet who looks good on paper, make an appointment without your cat when evaluating a veterinary clinic. By going to see potential vets without your cat, you will be more relaxed. Ask for a tour of the hospital. If you want to speak with a veterinarian, offer to pay for an office visit. Most vets won’t charge you for this introductory visit, but it sets the right tone for a future relationship of mutual respect. Come prepared with a list of questions. I will start! I would like to recommend Dr. Gary Richter, a holistic, integrative vet in Oakland, California. His clinic’s logo doesn’t have a cat, but he does have a cat at home and he takes delight in seeing our cats when we have appointments with him. Also, his clinic just opened a wing dedicated to cats (and birds). It sure does reduce cat-dog stress in the waiting room.